In an article in Theatre Arts from 1947, Hermine Rich Isaacs complains about the fact that since William Wyler's films "flourish neither the mark of an insistent personality, nor the aura of experiment, nor the cachet of conscious striving after artistic effect" he is being undeservedly neglected by archives and museums. Isaacs makes the claim though that Wyler is a true master, and just because he is not obviously artistic he should not be treated with this lack of interest (or lack of respect). Isaacs complaint is somewhat compromised by the fact that Wyler was perhaps the most celebrated filmmaker in the US at that time, but at the same time she has a point because with the exception of André Bazin, Wyler has been treated a bit off-handedly by the most influential of critics and scholars. In the post-war consensus he is sometimes seen as the opposite of the true glory of Hollywood and seen as boring, safe, dispassionate and audience-conscious as opposed to the likes of Nicholas Ray, Douglas Sirk and Vincente Minnelli. Andrew Sarris placed Wyler in the category Less Than Meets the Eye and it is noticeable that when people today talk about Bazin's writings they mention that he wrote about Orson Welles, Jean Renoir and the neorealist filmmakers. Less often is it said that Bazin idolised Wyler (and Anthony Mann), probably because Wyler feels less cool and cutting edge. Bazin's fullest exploration of Wyler comes in the essay "William Wyler: or the Jansenist of Directing", reprinted in Bazin at Work, and Bazin's enthusiasm is not surprising since the astonishing body of work of Wyler is enough to humble must critics. The Best Years of Our Lives (1946) is perhaps the most treasured but at least from 1936 he hardly ever failed, and even though the films were more uneven after the mid-50s there was still enough great scenes, great images and above all great acting to make up for any flaws that the later films might have had. I have been reading interviews with Wyler and they have been very interesting. He talks a lot about auteurs, and he argues that somebody like Preston Sturges can rightfully be called one, but he says about himself that "I could hardly call myself an auteur - although I'm one of the few American directors who can pronounce the word correctly." At another point he says that he is not a composer but more of a conductor. What he means is that the films he makes have been written by others, such as Lillian Hellman, or Robert Sherwood, or Emily Brontë. But at the same time he also says, and others have said as much, that he only made the films he wanted to make, films he felt strongly about, that he was very much involved from pre-production to post-production, that he wanted final cut (and usually got it), that he always worked on the scripts (telling the writer what to take out and what to add) and that he added things in the films that was from his own life. In addition, after the Second World War he created his own independent production company, together with George Stevens and Frank Capra, called Liberty Films. So even if he did not want to call himself an auteur he still wanted, and had, the power to go his own way (with the exception of strict censorship rules). Isaacs interviewed Wyler and when asked what makes for a good film Wyler answers "A story, a passion and a craft." That is apparent in his films and although Oscar nominations and winnings are not necessarily a sign of greatness, Wyler was actually nominated for an Oscar for best direction 12 times (a third of all his feature films), and won three times, and three times he was nominated for the Grand Prix/Palme d'or in Cannes, and he won once. Even though Wyler began as a maker of short westerns, as he came into his own in the mid-30s he was not a genre filmmaker. Primarily he was a witness to family disintegration and punishing social structures and conventions. Visually there are many striking things about Wyler's films, such as the use of deep focus and elaborate compositions, the excellent use of mirrors and staircases. When it comes to do interior compositions Wyler are among the very best, and mirrors are often at the centre of his compositions, like Bergman and Fassbinder. The films are often harsh and uncomfortable, there are a lot of cruelty in them, again like Bergman and Fassbinder. Not cruelty from Wyler towards the characters but cruelty between the characters. Fathers are cruel to their daughters, sons to their fathers, wives to their husbands, and so on, and it rarely ends well. Sometimes in death and despair, sometimes in sadness and regret, and often they are open-ended. Not even a romantic comedy like Roman Holiday (1953) ends in happiness, but in loneliness. Wyler had a deep understanding of suffering it would seem, and of seeing it. He is not the kind of filmmaker who would leave his characters unattended, he sees them all, and shares their pain. Watching Austin Sloper ridiculing and punishing his daughter Catherine in The Heiress is about as painful as it gets in cinema. 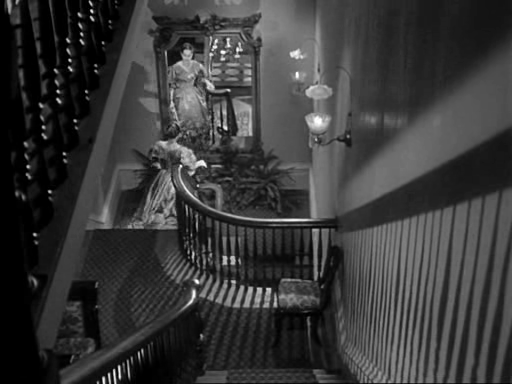 Quintessential Wyler, a staircase and a mirror. The Heiress. And then there are the actors. Ralph Richardson and Olivia de Havilland in The Heiress (1949), Walter Huston in Dodsworth (1936), John Barrymore in Counsellor-at-Law (1933), Laurence Olivier, Fredric March, Miriam Hopkins, Herbert Marshall, Bette Davis in several films. He once said that actors hated him on set but loved him at the award ceremonies, because his punishing direction methods led to remarkable performances. He had a theory that in order to get at the truth of a character the actors have to go beyond acting. The method for getting there was to do retake after retake, to wear down the actors until the acting disappeared and the truth would be revealed, the essence of the character. The actors should not play, they should be. (This is why he was called "90-take Willie" and why he frequently went over budget and over time.) His style of shooting could also be difficult, not least his habit of instead of cross-cutting between actors he would keep them in the same shot, but one with the back against the camera. That meant that one of the two actors had only his/her voice and neck to act with, and could not use the face. 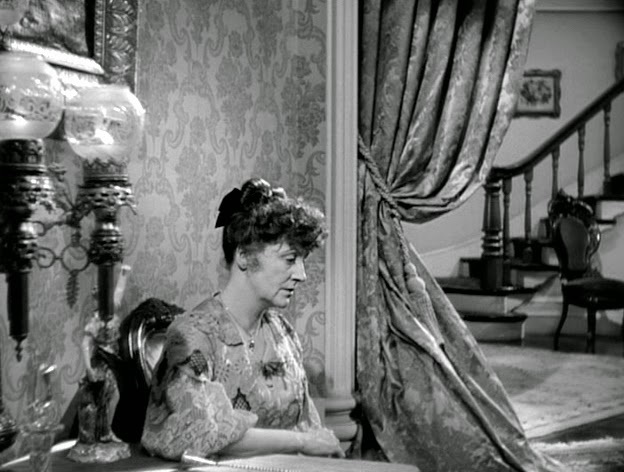 First there is the character Birdie in The Little Foxes (1941), played by Patricia Collinge. She is a sad older woman, treated with contempt by those around her, if they even notice her. 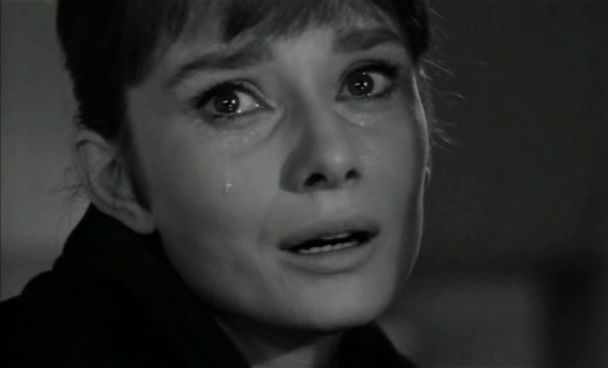 It is a heartbreaking character, and performance, and the key here is that Wyler sees her. She is often visible in shots, even if she plays no part, and goes unnoticed by the other characters. It is as if Wyler is the only one aware of the fact that she is there, and her loneliness and fragility is underscored not by focusing in her, but rather by not doing so. She is there, and she suffers, and that is enough. Wyler is good at that, seeing and capturing the emotional state of his characters, and being concerned about them. Birdie in The Little Foxes. The next example is related, and it is from the beginning of Mrs Miniver (1942). The station master is waiting for Mrs Miniver to step of the train, and when she does he says that he wants to show her a new rose he has created. She hesitates but then follows him. She looks at it, and smells it, and when she smells it we see a reflection of the station master in a round mirror. He captures his breath. It is as if he cannot believe his courage and luck, of having approached her, and then having her smell his rose. It is a tiny little thing, but it makes the scene almost disproportionally moving. And of course, we did not have a close-up of him; we were looking at her, smelling the rose. The mirror reflection is behind her. In the same film, Mrs Miniver and her daughter-in-law Carol (played by Teresa Wright) are out driving when a German fighter plane attacks. Carol is hit, and they take cover in a house. Carol lies down on the floor while Mrs Miniver goes for help. There, in a long take with the camera far away from her body, Carol dies, quiet and alone on a wooden floor. There is no music, just the sound of her sobbing, until it stops. It is such a sad death scene because it is understated and she is all alone on the hard, cold floor. The next example is from Roman Holiday with Audrey Hepburn and Gregory Peck. When they first meet she is drunk, he is not, and he takes her to his small apartment. She spends the night there, in separate rooms. The next morning she wakes up and has forgotten where she is and how she got there. It is so good, because they are so natural and relaxed. The teasing, the rapport, the combination of amusement and tenderness makes the scene feel wonderfully alive and enchanting. Peck is often rather stiff, or gruff, but not here. And Hepburn is at her best, breezing through the scene. The last example is the ending of The Children's Hour (1961). The film has some of Wyler's most impressive deep focus compositions and some excellent acting, with several really intense scenes, but it is not one of his best. The last ten minutes though are fantastic. Karen (Audrey Hepburn) is talking a walk and then, sensing something is wrong, turns and runs back to the home that she shares with Martha (Shirley MacLaine). The scene is first lyrical, relaxed and leisurely. But when she runs back it is a series of jump cuts of her face. When she comes back she finds Martha dead, having committed suicide. The cause of this is the malicious gossip in the small town about the two women, and the rumours that they are lesbians. (At least Martha is a lesbian whereas Karen's sexuality is more ambiguous.) The next scene is the funeral, which is short. Karen does not speak to anyone, she does not even look at them. She stands tall, and her contempt is in her body language. Her one-time boyfriend is there too, but she does not acknowledge him. She walks away from the funeral service, still without looking at anybody, just straight ahead. She will have no part of them, or their world. There is no heterosexual reunion between her and the man, instead she walks away alone under some trees, and then she looks up towards the tree tops and the sky. And then she smiles. It is as if she has come to terms with herself, and that she is now one with Martha. 2014-06-13, I added some photos and corrected some grammatical errors. In Laura Mulvey's book Death 24x a Second there is a chapter about Rossellini's Journey to Italy (1953). She writes: "In Journey to Italy, out of a minimal plot line and two bewildered Hollywood stars, Rossellini managed to create, in the opinions of many critics, the first modern film." She is right in saying that many others have called this "the first modern film" and the reasons for this are, it seems, the film's improvisations, meandering narrative and how it pauses and gives the audience time and space to reflect on what is happening on the screen. As readers of this blog are no doubt aware there are few things I am more allergic to than claims about something being "the first". These claims are usually about concrete things, such as a particular stylistic achievement, a narrative convention or a technical breakthrough, and since they are concrete it is easy to point at a film and say that "there it is". This claim about Journey to Italy, or any other film, being "the first modern film" is much more abstract and therefore trickier to argue about. But it is also all the more reason why it is an almost meaningless statement. Why is it that this particular form of filmmaking is "modern"? Why for example are not experimental films made in the 1920s, such as Entr'acte (1924), modern? Why should Journey to Italy be deemed modern but not Buster Keaton's Sherlock Jr. (1924) or Jean Vigo's films, including L'Atalante (1934)? Sometimes these films from the 20s are called "modernistic" instead, rather than "modern", which I think is cheating, but even if we were to go along with that argument then why is for example Stromboli (1950) or Umberto D. (1952) not modern but Voyage to Italy is? Besides, many 1930s films by for example Jean Renoir and Kenji Mizoguchi have the same approach to narrative and characters as these post-war films so could be called modern according to this definition. But they are not experimental in the way as some of those films from the 1920s and should consequently not be called modernistic. And what is to be done about Howard Hawks? His often blatant disregard for story and narrative, and the way the films are based on improvisation, makes them equally modern. Just think of The Big Sleep (1946). Hawks's films also constantly refer back to other films, and make fun of genres and actors. They are also self-referential. 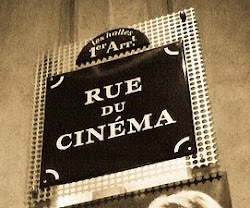 Yet many, including Jean-Luc Godard, have argued that the generation who emerged in the 1950s (Godard's generation) were the first filmmakers who were conscious of the medium's past and made films that were reflections of earlier films, and that this is an important aspect of "modern" cinema. I am not sure there is any truth to this claim. Many filmmakers of the earliest generations have said that they learned how to make films by watching other films, and watching filmmakers at work, They did perhaps not go to film schools or cinematheques, but they learned by way of apprenticeship and by going to the cinema. Is it not condescending to earlier filmmakers to say that they were not aware of their own history, unlike the alleged enlightenment of later generations? It would be more accurate to suggest that this awareness is as old as cinema itself. When Chic Johnson finds a sled named Rosebud in Hellzapoppin' (1941) and says "I thought they burnt that. ", it is very much a sign of awareness and reflexivity. Filmmakers have always made films that are consciously built on earlier films, and are reflecting upon film history, either repeatedly like Billy Wilder, or occasionally, like Hasse Ekman. And let's not forget that Hollywood has always been fascinated by films about itself, exemplified for example by Show People (1928), Sullivan's Travels (1940) and Singin' in the Rain (1952), to name three beginning with S.
In general history modernity is often said to have appeared with the renaissance in 14th century Italy. In art history modernism is traditionally said to appear at the beginning of the 20th century, such as Picasso's cubist paintings (following Paul Cézanne, Wassily Kandinsky and others, going back to the second half of the 19th century). In literature there was T.S. Eliot, Virginia Woolf, James Joyce and the others in the 1920s (also with forerunners of course such as Proust, Kafka, Lawrence, Conrad), simultaneous with popular modernist film movements. But definitions of modernity, what is "modern" and what is "modernism", are never clear, and cannot be. If we are talking of storytelling then "modern", as in something that is not linear, sometimes fragmented, and that lacks a clear closure, is almost as old as "classical" storytelling. Perhaps even older. In many ways cinema and modernity go hand in hand, and are intimately connected, right from the start. But I do not think that there is a film which can be called "the first modern film" and nothing is gained by trying to find one. These arguments often make me think of children who argue about who's father is the tallest ("my film is more modern than yours"). And now I, too, have indulged in this. Perhaps it can also be argued that a poem like Eliot's The Waste Land is post-modern, just as well as modern, which one might perhaps say about The Big Sleep as well. He was very Polish, and worked exclusively in Poland for the first 24 years of his career. But he was also very European. As soon as the iron curtain came tumbling down the European in him burst out. The Double Life of Veronique (1991) is set in Poland and France, as is Three Colours: White (1992). Three Colours: Red (1994) is set in Switzerland and Three Colours: Blue (1993) is set in France and is partly about the creation of a symphony to be played at the day of Europe's unification. There are some differences between the Polish ones and the European ones, in terms of the look of them, with the Polish ones being more gritty. There is little obvious beauty in the images of, say, A Short Film About Killing (1988) whereas Three Colours: Blue has beauty written all over it. That is not meant as criticism of one or the other, in both cases the look of the film is appropriate for the story that is being told, I just mean that there is a difference. And the style of his films evolved over time, there are no clear breaks. Thematically the films are consistent, about how people are interconnected, whether they know it or not, and how events in the past and the present are linked, how things are repeated. Even though chance and luck seems to be what governs our lives it is all apparently part of some master plan. I have not seen any of his early documentaries, the first of his films that I have seen is Camera Buff (1979, original title is Amator), which is excellent and is from when Kieslowski was part of the Polish film movement called "cinema of moral anxiety", in the late 70s and early 80s. Camera Buff is about a man who is an amateur filmmaker and whose camera is always with him. He is also making films for the Communist Party, who of course censors his work and criticise it. He becomes more self-absorbed in his filmmaking, leading to the breakdown of his marriage, and in the end he starts to film himself. It is as good an introduction into the world of Kieslowski as one could hope for, filled with irony, passion and philosophical ideas. Also excellent is his next film, which is probably the most celebrated of his early films, Blind Chance (1981). It is popular among philosophy scholars since it shows how fate trips up the life of a man, with the narrative a three-forked path. We get three alternative versions of what this man's life might be like. I am not sure if I have a particular favourite among his films, but I have a special feeling for Blue. Julie (played by Juliette Binoche) looses her husband and daughter in a car accident, and although badly injured she survives. But she does not want to. She succumbs to depression and suicidal thoughts, yet something holds her back. Slowly, almost imperceptibly, the will to live, to live on, gets stronger and she connects with the world again. It is beautiful, and moving, and very uplifting. The music is part of that. I said that she connects with the world again. However, the feeling of Kieslowski's films is that, although set in the real world, they really belong to a Kieslowskian world, which is like our world, but only just. An absurd world, strange, cruel and beautiful. I should perhaps add that "cinema of moral anxiety" was a loose movement in the late 1970s (ending more or less with general Jaruzelski becoming prime minister in 1981, and declaring martial law) which told stories about political disillusion and moral corruption, as well as domestic strife. Among the most well-known participants were Kieslowski, Krzysztof Zanussi, Agnieszka Holland and Andrzej Wajda.